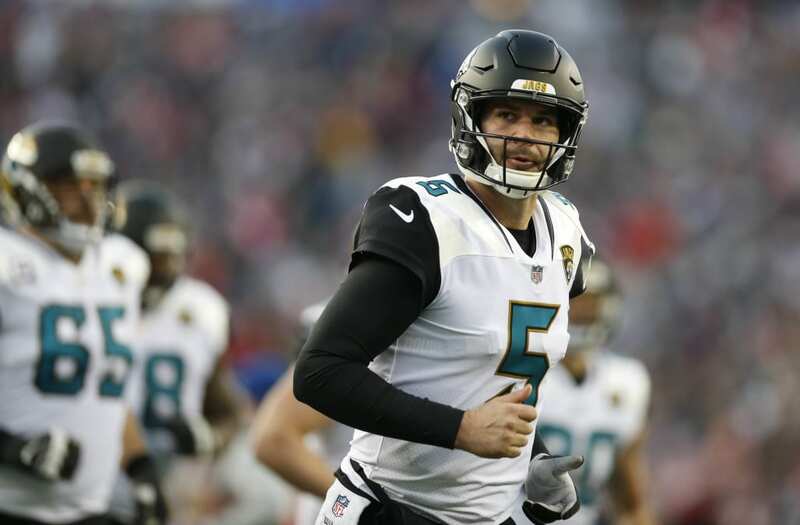 Blake Bortles has been called trash, subpar and a choker, all by opponents he beat during the 2017 regular season to put the Jacksonville Jaguars in position to be called AFC champions. "To me, you see a winner, a quarterback that is smart, that makes all the right plays," Patriots defensive back Devin McCourty said. "When he's out there, he's trying to put his team in the right position, and it shows up." Some of the numbers and recent performances imply Bortles is not one of the NFL's elite quarterbacks. Consider that he ranked in the bottom five of 36 in passer rating among passers with at least 15 starts from 2014-2016. Two other names on that list: Case Keenum of the Minnesota Vikings and Nick Foles of the Philadelphia Eagles, who are competing as the starting quarterbacks in the NFC Championship on Sunday. Bortles had only 87 passing yards -- 88 rushing -- in the wild-card round win over the Buffalo Bills. He was 14 of 26 for 214 yards last week at Pittsburgh, but delivered a few timely, accurate throws to help the Jaguars pull off the 45-42 upset. Patriots head coach Bill Belichick promised his defense this week that Bortles belongs, imploring the squad not to sell short a quarterback that won a division title and two playoff games to set up Sunday's AFC Championship game in Foxborough, Mass. "He makes it all go," Belichick said of Bortles. "He's played well. "He's got again a very high rushing average. When he carries the ball, he carries it productively, whether that's on the scramble or designed runs. He throws the ball efficiently, like he did in the Pittsburgh game. So (he) makes good decisions. He's a big, strong, tough guy that's hard to bring down, hard to tackle. He's got a lot of good receivers, good tight ends, good weapons, good offensive line." Houston Texans defensive end Jadeveon Clowney referred to Bortles as "trash" and Seattle Seahawks safety Earl Thomas labeled Bortles "subpar" following a 30-24 loss in December. Then there was Titans defensive end Jurrell Casey, who took a video predicting Bortles would "choke" while the Titans moved on in the playoffs. The Titans lost at New England last week a day before Bortles beat the Steelers. "You can't be trash and be in the championship game," Patriots defensive back Eric Rowe said. Bortles said he's not worried about being tagged with any labels or nicknames, and if he's being harshly judged by less-than-traditional output on the way to the Super Bowl, go ahead and drop the gavel. "I don't care much about what is said outside of our locker room," Bortles said. "What I care about is in that locker room. Those are the opinions I care about is what I am trying to say. When other people say stuff or it comes from anywhere, it doesn't bother me. To see guys within that locker room stand up and say stuff is pretty cool. Those are the opinions that I value and the guys that I want to impress and do well for."